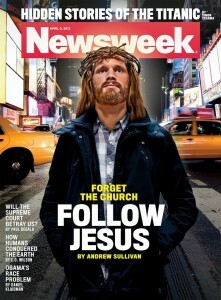 Newsweek’s cover story, written by popular author Andrew Sullivan, encourages Americans to “forget the church” and just “follow Jesus.” . . .
Sullivan sees the problem of a politicized faith, one that focuses relentlessly on gaining power, changing laws, and regulating the morality of others. He sees contemporary Christianity as a faith obsessed with getting doctrines about Jesus right to the exclusion of what He actually taught us to do and be. . . .
From the Catholic Church’s teachings on sexuality to evangelical Christian support of torture, Sullivan makes his way through a long list of perceived threats to the centrality of Christ among believing people. So what’s the solution? Sullivan points us toward Francis of Assisi and Thomas Jefferson. Francis – for the simplicity of his vision for following Jesus. Jefferson – for the way he stripped away all the miracles of incarnation and resurrection and got to the greatest miracle of all: Jesus’ message of love. Wax sympathizes with the questions and critiques that Sullivan raises (being more charitable than I; Sullivan’s historical inaccuracies and theological caricatures would hardly be permissable in a freshman religion class), but puts his finger on several critical flaws. His full response is well worth the read. Sullivan wants to take Christ’s teaching without Christ Himself. His vision tries to deliver Christ’s message of love without the atoning cross that gives love its meaning. It wants Christ’s justice without the victorious resurrection that launches the new world God has promised , the new world that totally changes the landscape for how we view everything: ethics, morals, politics, art, law. . . . The answer to Andrew Sullivan is to point back to everything the Gospels tell us. Let’s not isolate the sayings of Jesus we like and fit Him into our vision for how the world should work. Instead, let’s fall at the feet of King Jesus, ready and willing to do whatever it takes to fit our lives into His vision, a vision of the world to come that has crashed into the world that is. ← Isaiah 52:1-12: Behold your King!